Round 2 of the NBA playoffs is now in the books and while it has given us exciting basketball, the results are painfully devoid of surprises: Golden State and Houston, respectively seed one and seed two of the Western Conference and Atlanta and Cleveland, respectively seed one and seed two of the Eastern Conference, have qualified. There was none of that blissful playoffs chaos in round 2, logic was respected and arguably the four best teams in the NBA are left to battle for the Larry O’Brien trophy. Now this is somewhat exciting since the last of these four teams to be sacred champions was the 1994-95 Houston Rockets, which is a telltale sign that the NBA is moving on from the epic Los Angeles Lakers vs San Anontio Spurs vs Miami Heat rivalries, hopefully towards bigger, better and more exciting things. This series is going to boil down to Mike Budenholzer vs Coach LeBron James. How can the coach of the year figure a way to keep LeBron out of the paint? What can he get out of Paul Millsap with a bad shoulder? Will he let DeMarre Carroll go one on one with the King on defense? What is he going to do if Timofey Mozgov can defend Al Horford at the rim? I wouldn’t want to be in Mike Budenholzer‘s shoes, right now. There are so many things that can go wrong for his team against Cleveland and it would take nothing short of a miracle to figure them all out. Only thing I’m confident in, is that Jeff Teague can hold off a gimped Kyrie Irving at the perimeter. He was a sneaky good defender against Stephen Curry all year, I don’t know why he wouldn’t be able to defend 50% of Kyrie Irving. In Cleveland, everything is going as planned. They broke the Chicago Bulls once again (and maybe for good, this time). LeBron James threw his coach under the bus on critical game 4’s winning play and the Cavaliers are turning into become his own personal utopia and they’re about to face a smaller, more vulnerable and banged up team than the one they just eliminated in round 2. If the Cavaliers can figure out the Teague/Horford pick-and-roll with Kyle Korver as a failsafe option in the corner, I think Atlanta’s dead in the water. Don’t hold your breath for an exciting series, people. 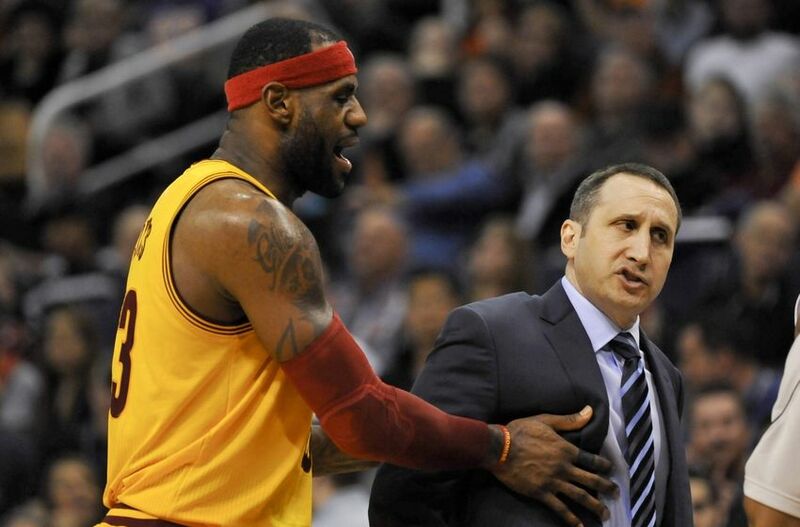 I just hope that Dan Gilbert shows mercy on David Blatt and fires him before depression and feelings of inadequacy get the best of him. I’m sorry if you thought this series would be a showdown between reigning MVP Stephen Curry and early MVP contention favorite James Harden, but it’s so not going to be that. Head coach of Golden State Steve Kerr is too smart to let that happen. There are two things that will dictate this series 1) Houston is missing their key guy to defend Steph Curry‘s 3 point shooting avalanche. Patrick Beverly, arguably one of the best defenders in the NBA is injured, and the Rockets have been playing Jason Terry and Pablo Prigioni instead and none of these two guys will stop Stephen Curry from putting 30 points a night. On the other end though, Golden State have three guys: Klay Thompson, Harrison Barnes and Andre Iguodala (off the bench) who can take turn at containing James Harden. So that showdown’s not happening. Second key thing that’ll dictate the series is that Golden State doesn’t have one, but two guys who can defend Dwight Howard: Draymond Green and Andrew Bogut, who’s finally playing like the rugged 7 footer Golden State traded for during the 2011-12 season. Dwight is going to get denied, frustrated, Harden is going to get swarmed, there is no ending to this series where I can see where the Rockets win, except maybe if Clint Capela turns into Serge Ibaka overnight and Trevor Ariza into Paul Pierce. The Rockets should be proud of themselves though. They wrestled their series from the brink of elimination and broke the Los Angeles Clippers, who seemed to have been carrying momentum since their epic elimination of the San Antonio Spurs. It’s a victory that’ll help them gel as a team and give invaluable experience to their young players. Unfortunately for them though, it stops here. They are not beating the Golden State basketball machine.